The joint forum on sugar and horticulture sectors on employment creation was organized by the Partnership for African Social Governance Research (PAS GR) in collaboration with the Centre for African Bio-Entrepreneurship (CABE). The forum was held in Nairobi, Kenya. The meeting brought together stakeholders from the Utafiti Sera House namely: INCLUDE, Horticultural Crops Directorate (HCD), Institute of Development Studies (IDS), University of Nairobi, Fresh Produce Exporters Association of Kenya (FPEAK), Sugar Campaign for Change (SUCAM), Kwale International Sugar Company, TechnoServe Kenya, academia and ANC – NASA Technical Committee representatives. 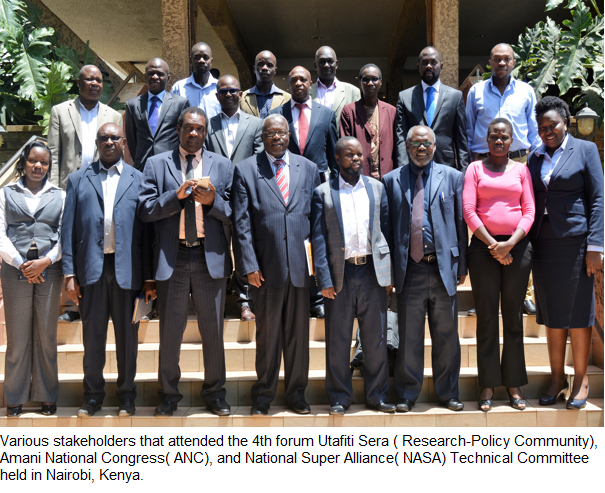 This was the fourth forum after the launch of the Utafiti Sera forums on Sugar and Horticulture.The main purpose of the fourth forum was to present the key policy issues in sugar and horticulture sectors and to use the evidence to engage policy actors for policy uptake.